Fletcher is a Royal Best of Breed winner, Royal Challenge and Reserve Challenge winner and multi in group winner. 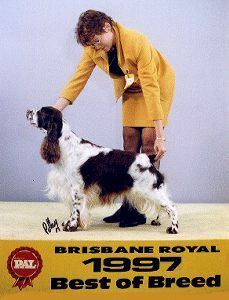 Fletcher is the sire of Australia's FIRST black and White Grand Champion Ndolge Bite the Bullet. Sadly we lost Fletcher in 2007 but his legacy lives on in his children and grandchildren.